Although declared as a research priority more than 40 years ago, the knowledge about the magnitude and mechanisms of carbon (C) fluxes between plants and their mycorrhizal fungal symbionts remains fragmentary. In spite of a number of experiments with isotopically labeled C documented rapid and directed C transfer from the host plant to its mycobionts, the molecular mechanisms and their regulation involved in such a transport remain largely unknown. It seems that in many arbuscular mycorrhizal (AM) symbioses, the C costs remains well below 10% of the C fixed photosynthetically by the host plants. Higher values were detected in the past only under specific situations such as in young plants, under low light intensities, and/or for particular partner combinations, involving very costly (in terms of C demand) and little nutritionally beneficial AM fungi such as Gigaspora sp. 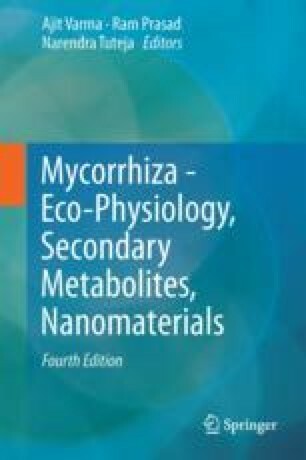 Ecological context of the common mycorrhizal networks in terms of redistribution of symbiotic C costs and nutritional benefits on one hand and C movement through soil food webs beyond mycorrhizal hyphae on the other are briefly discussed in this chapter, and further research challenges and open knowledge gaps with respect to C fluxes in mycorrhizal plants are outlined. Research funding was provided by the Czech Science Foundation (project 14-19191S) and the Czech Ministry of Education, Youth and Sports (project No. LK11224). The authors also gratefully acknowledge further support from the Czech Academy of Sciences (J. E. Purkyně Fellowship to JJ) and the long-term research program RVO 61388971.